Take a long drive in the countryside and you’re bound to see old, listing, weather-worn farm houses and buildings with rusty, but intact, metal roofs. Nearby, asphalt-shingled buildings and barns of the same vintage, reveal gaps, holes, and roofing that is all but gone. The point? Metal roofs last longer — up to 100 years. Although older metal roofing may rust and suffer from the ravages of time, today’s well-maintained metal roof — even after years of hard-service — will endure and prove worth their initial installation expense. Can an older metal roof be repaired? Today’s metal roofing is far superior to the “tin roofs” of days past. However, older metal roofing may just need repair to keep your home and belongings protected. The trained, professional roofers at Straight Line Roofing & Construction will thoroughly inspect your metal roof to determine if repair alone will get your roof back into shape, or if replacement is necessary. Dirty and leaf-littered metal panels — A metal roof is designed to allow water to run unobstructed down its panels and off the roof. Put some obstructions in its way — piles of leaves, broken branches and other tree debris — and water will begin to pool beneath the litter, allowing moisture to seep in under the panels over time. Even a good roof will begin to fail under those circumstances. Keep your metal roof clean and those seepage problems disappear. Wind, hail or storm damage can loosen panels, screws or puncture metal roofing. Strong winds that find a foothold under a metal roof panel cause it to belly out, working loose screws and nails. Dents in metal panels from hail mean a compromised roof. Regular inspection of your metal roof, especially after a storm, can mean the difference between a quick fix and an extensive metal roof repair job. Older, non-galvanized metal panels rust easily. Newer, colorful, state-of-the-art metal roofs are aimed at making rust problems virtually nonexistent. 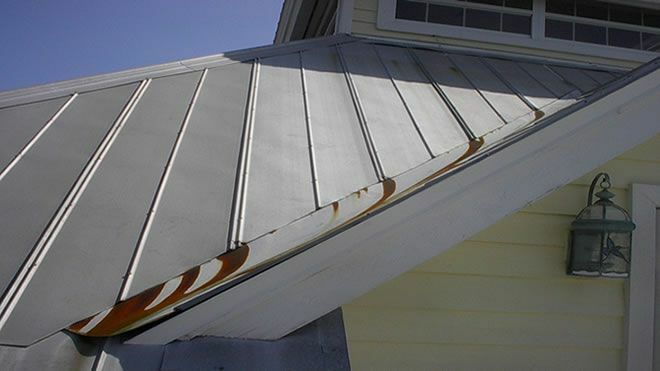 Homeowners with untreated, uncoated metal roof panels need to be especially vigilant when it comes to spotting troublesome rust areas that weaken panels and allow water seepage to occur. Flashing on a metal roof can be a nightmare, especially if the roof and flashing were poorly installed. Checking to make sure flashing is still watertight and any roof sealant crack-free and undamaged. Schedule Your Metal Roof Inspection Today! Scheduled inspections of your metal roof ensures a roof that lasts a lifetime. Timely identification and maintenance is a wise move and one that can save you from having to deal with expensive, extensive metal roof repair. 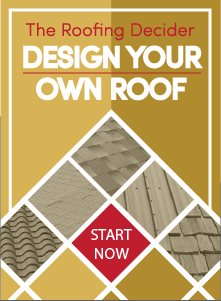 Straight Line Roofing has the experience and knowledge you want when dealing with metal roof repairs. Contact them today! Copyright © Straight Line Construction All Rights Reserved.